We've done some good work over the past year with Henllys Church in Wales School, Coed Eva Primary School and the 1st Henllys Scouts. 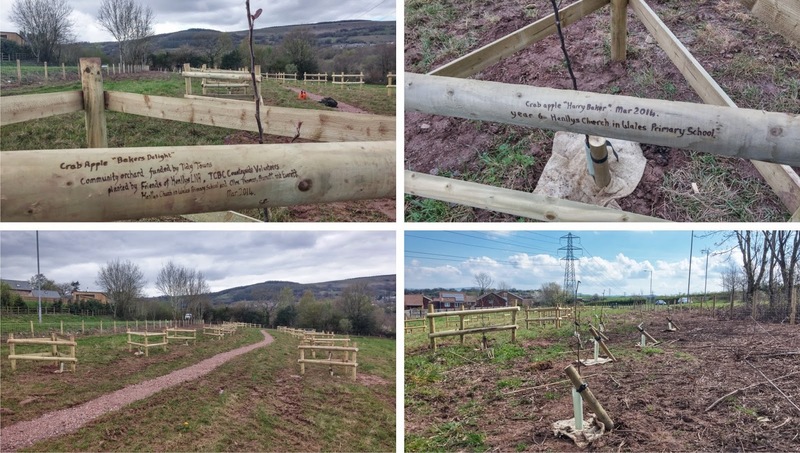 We continued our work with local young people recently by planting up the Villager's Orchard. This was all part of the Welsh Government Tidy Towns funded grant which TCBC successfully applied for to support the voluntary conservation and educational work we have done here since 2008. 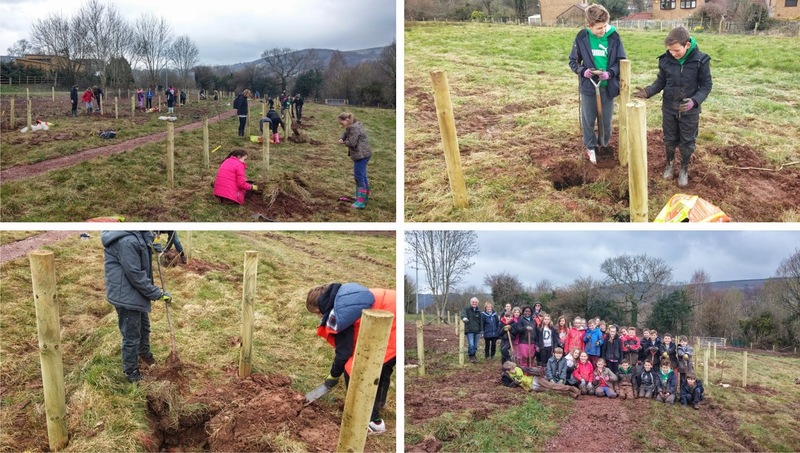 26 pupils and 4 adults from Henllys Church in Wales Primary School, 1 Henllys Community Councillor, and two local County Councillors,Torfaen Council Countryside Section and 2 volunteers, joined with 3 volunteers from Friends of Henllys LNR to plant the 30 trees. The eventual fruit will be for the community, but the wide variety of flowers will provide a boost for pollinator species especially bees. Fruiting trees include, apple, plum, pear, cherries and damsons. The trees were pre-dug by a mini-digger to make it easier for us, but this turned out to make things more difficult as they had filled with water and were enormous, so we had to bail them out and then fill them back in. The children turned up, we gave them our Keep Wales Tidy funded gloves and after a quick demonstration they got stuck in. They had to backfill the hole, add compost and the magic powder, then fill up the hole to the level of the scion. Finally they added a coir tree mulch to give the trees the best chance of success. Great fun and muddiness was had by all. 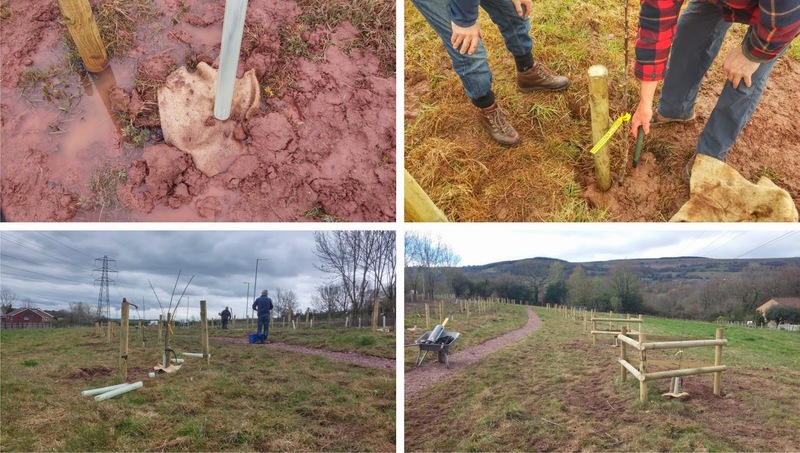 Afterwards, tree guards were added and in the 2 following weeks, stakes were added with much appreciated guidance from TCBC Countryside Volunteer Mr. Adkins. Soggy roots, advice from Mr Adkins and getting the trees railed off. Finally, some of the rails were pyrographed (another Tidy Towns-funded too that we requested) helping us to keep a better record of the planting plan. Later on we will get Year 6 to add their names to the rails and perhaps a sentence about why the trees are good for us and wildlife. Chris Partridge from Friends of Henllys LNR said "We were grateful to be a part of this large Tidy Towns funded project and today we have shown that with a bit of help we can make a great difference in our community with this great community event. Hopefully there'll be some fruit left for me, and in many years to come some of the children who took part today can tell their grandchildren that they planted this magnificent orchard"